I really like this hostess set, so I had to make another one. This one I CASEd from another lady on Splitcoastampers (SCS). I don't know her real name, but her SCS name is Tamamamma. I changed it a little bit, but very little. 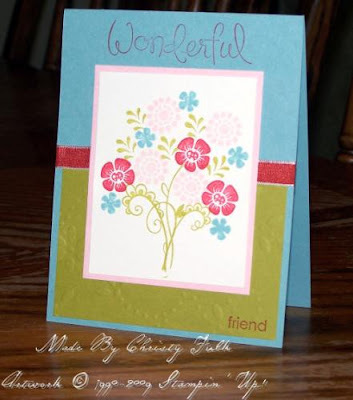 I used a different greeting, and I used cardstock I embossed with a Texturz Plate instead of designer paper. Other than that, it's the same card. Thanks, Tamamamma, for the wonderful card. I love it! Supplies: Itty Bitty Buds & Wonderful Favorites Sets; Baja Breeze, Kiwi Kiss, Pink Pirouette, & Whisper White cardstock; Baja Breeze, Kiwi Kiss, Pink Pirouette, & Riding Hood Red Classic Ink Pads; Riding Hood Red Taffeta Ribbon, Big Shot Die-Cut Machine, Texturz Impressions Pad, Texturz Silicone Rubber, & Stampin' Up! Backgrounds I Texturz Plates.